The famous suffragist is shown here firing thunderbolts of equality. Her longtime friend and fellow suffragist Elizabeth Cady Stanton once famously said of Anthony, "I forged the thunderbolts, she fired them." The women's suffrage movement began in earnest with the Seneca Falls Convention in 1848. Three years later Susan B. Anthony met Elizabeth Cady Stanton. The two women became close friends and formed a powerful duo as co-workers. Susan B. Anthony worked very closely with Elizabeth Cady Stanton in the women's suffrage movement. Stanton married and had several children while Anthony remained single her entire life. Anthony would often assist Stanton with her domestic work to free Stanton to write and strategize. Anthony, equipped with Stanton's creative input, would then hit the road, giving speeches, circulating petitions, and giving the movement its energy. 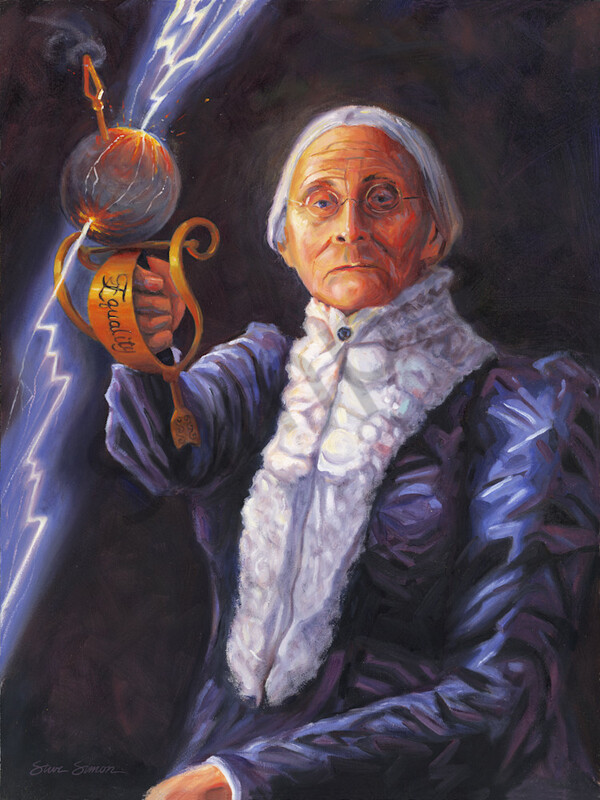 Speaking of her relationship with Anthony, Stanton once said, “I forged the thunderbolts and she fired them.” The composition features Anthony firing the thunderbolt of equality.